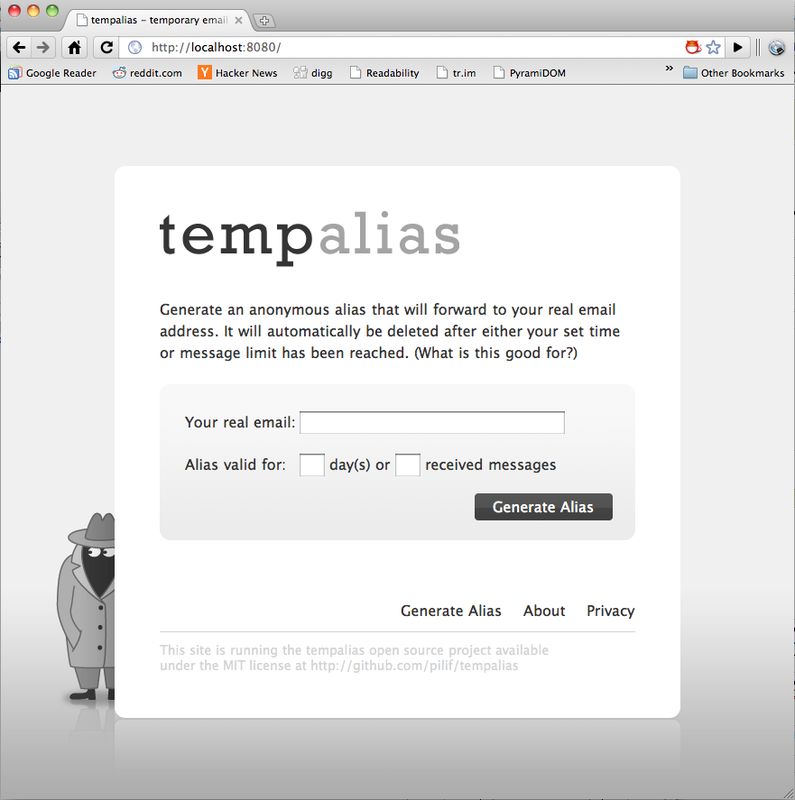 While the user experience on tempalias.com is already really streamlined, compared to other services that encode the expiration settings and sometimes even the target) into the email address (and are thus exploitable and in some cases requiring you to have an account with them), it loses in that, when you have to register on some site, you will have to open the tempalias.com website in its own window and then manually create the alias. Wouldn’t it be nice if this worked without having to visit the site? The workflow will be that you create your first (and probably only) alias manually. In the confirmation screen, you will be presented with a bookmarklet that you can drag to your bookmark bar and that will generate more aliases like the one just generated. This works independently of cookies or user accounts, so it would even work across browsers if you are synchronizing bookmarks between machines. The actual bookmarklet is just a very small stub that will contain all the configuration for alias creation (so the actual bookmarklet will be the minified version of this file here). The bookmarklet, when executed will add a script tag to the page that actually does the heavy lifting. it doesn’t pollute the global namespace. It has to add one function, window.$__tempalias_com, so it doesn’t reload all the script if you click the bookmark button multiple times. if jQuery 1.4.2 is already used on the site, it uses that. if any other jQuery version is installed, it loads 1.4.2 but restores window.jQuery to what it was before. In all cases, it calls jQuery.noConflict if $ is bound to anything. While implementing, I noticed that you can’t unbind live events with just their name, so $().die(‘.ta’) didn’t work an I had to provide all events I’m live-binding to. I’m using live here because the bubbling up delegation model works better in a case where there might be many matching elements on any particular page. Now the next step will be to add some design to the whole thing and then it can go live. This is the last part of the development diary I was keeping about the creation of a new web service in node.js. You can read the previous installment here. The layout is finished, the last edges too rough for pushing the thing live are smoothed. tempalias.com is live. After coming really close to finishing the thing yesterday (hence the lack of a posting here – I was too tired when I had to quit at 2:30am) last night, now I could complete the results page and add the needed finishing touches (like a really cool way of catching enter to proceed from the first to the last form field – my favorite hidden feature). All in all, the project took a time span of 17 days to implement from start to finish. I did this after work and mostly during weekdays and sundays, so it’s actually 11 days in which work was going on (I also was sick two days). Each day I worked around 4 hours, so all in all, this took around 44 hours to implement. The author of redis-node-client didn’t like my patch, but we had a really fruitful discussion and node-redis-client got a lot better at handling dropped connection in the process. 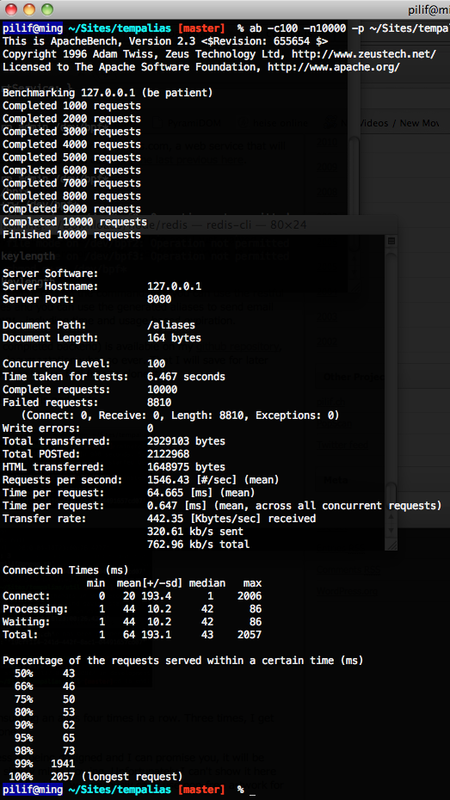 Before I continue, I want to say a huge thanks to fictorial on github for the awesome discussion I was allowed to have with him about node-redis-client’s handling of dropped connections. I’ve enjoyed every word I was typing and reading. Non-third-party code consists of just 1624 lines of code (using wc -l, so not an accurate measurement). This doesn’t factor in the huge amount of changes I made to my fork of node-smtp the daemon part of which was basically non-existant. node.js and friends are still in their infancy. While node removes previously published API on a nearly daily basis (it’s mostly bug-free though), none of the third-party libraries I am using were sufficiently bug-free to use them without change. the guys behind node.js. I would have had to do this in PHP or even rails (which is even less fitting than PHP as it provides so much functionality around generating dynamic HTML and so little around pure JSON based web services) without you guys! 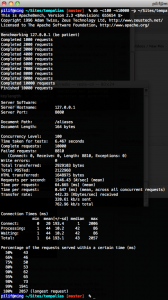 fictorial for redis-node-client and for the awesome discussion I was having with him. kennethkalmer for his work on node-smtp even though it was still incomplete – you lead me on the right tracks how to write an SMTP daemon. Thank you! The guys behind sammy – writing fully JS based AJAX apps has never been easier and more fun. The next step will be marketing: Seing this is built on node.js and an actually usable project – way beyond the usual little experiments, I hope to gather some interest in the Hacker community. Seing it also provides a real-world use, I’ll even go and try to submit news about the project on more general outlets. And of course on the Security Now! feedback page as this is inspired by their episode 242. This is one more episode in the development diary outlining the creation of a node.js based web service. You can read the previous installment here. 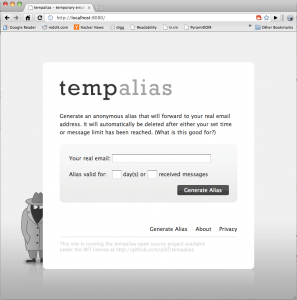 Today I could finally start with creating the HTML and CSS that will become the web frontend of the tempalias.com site. On Sunday, when I initially wanted to start, I was hindered by strangeness and overengineering of the express framework and yesterday it was general breakage in the redis client library for node. But today I had no excuse and I started doing the HTML and CSS work with the intention of converting Richard’s awesome Photoshop designs into real-world HTML. My main issue with this task: I plain don’t know CSS. Of course I know the syntax and how it should work in general, but there’s a huge difference between being able to read the syntax and writing basic code and actually being able to understand all the minor details and tricks that make it possible to achieve what you want in a reasonable time frame. In contrast to real programming languages where you are usually developing for one target (sure – there might be plattform differences, but even nowaways, while learning, you can get away with restricting yourself to one plattform), HTML and CSS provide the additional difficulty that you have to develop for multiple moving targets, all of which containing different subtle bugs. Combine that with the fact that more than basic CSS definitely isn’t part of my daily work and you’ll understand why I was struggling. In the end I seem to have gotten into the thinking that’s needed to make elements appear in the general vicinity of where you suppose they should end up. I even got used to the IMHO very non-intuitive way of having margin and border be part of the elements dimensions in addition to their padding so all the pixel calculations fell into place and the whole thing looks more or less acceptable. Until you begin changing the text size of course. But there’s so much manual pixel painting involved in the various backgrounds (gradient support isn’t quite there yet – even in browsers) that it’s probably impossible to create a really well-scaling layout anyways, so what I currently have is what I’m content with. You want to have a peek? I didn’t upload anything to the public site yet because there’s no functionality and I wouldn’t want to confuse users reaching the site by accident, so a screenshot will have to do. Or you clone my repository on github and run it yourself. The really tricky thing and conversely the thing I’m really the most proud of is the alignment of both the spy and the reflection of the main page content. You witness some really creative margin- and background positioning at work there. Oh. And I just don’t want to know in what glorious ways the non-browser IE butchers this layout. I. just. plain. don’t. care. This is supposed to be a FUNproject. Tomorrow: Hooking in Sammy to add links to all the static pages.